The first step in producing SNG is the production of syngas via gasification. The raw syngas is cleaned up to remove particulates and to convert any COS to H2S, for later removal. In some cases, the CO2 generated can be captured and sequestered (CCS). In this case, the syngas is first processed by a shift converter to increase CO2 capture efficiency and increase the BTU content of the synthesized SNG. 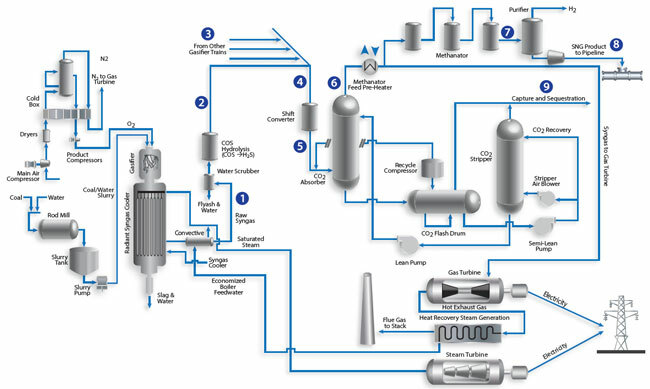 In an IGCC power plant, the syngas is used as fuel gas for a combustion turbine. When power demand is less, some of the syngas can be converted to SNG via methanation, and subsequently purified and compressed to meet pipeline quality and pressure. Obtaining reliable analysis in the SNG production process can be challenging due to extreme stream conditions. The Optograf™ Gas Analyzer is a unique spectroscopic instrument capable of analyzing these challenging streams.